Objective of the technique: Displacement of the catheter is one of the common complications following placement of the Ventriculoperitoneal shunt. The more common site of migration of the catheter is into the parieties of the abdominal wall resulting in CSF collection in the subcutaneous tissue and associated catheter blockade. Displacement of the catheter necessitates repositioning of the catheter. Laparoscopic repositioning has many advantages over lateral celiotomy, including cosmesis thereby avoiding a long scar, particularly in obese patients. In this group of patients where to obtain adequate exposure, a longer incision has to be taken along with extensive subcutaneous dissection. If a catheter is placed in an area of previous abdominal surgery the tip of the catheter is likely to be passed onto an area of adhesions or into the preperitoneal space. Laparoscopy allows placement of the desired length of the catheter under direct visualization and positioning of the tip in the desired location. 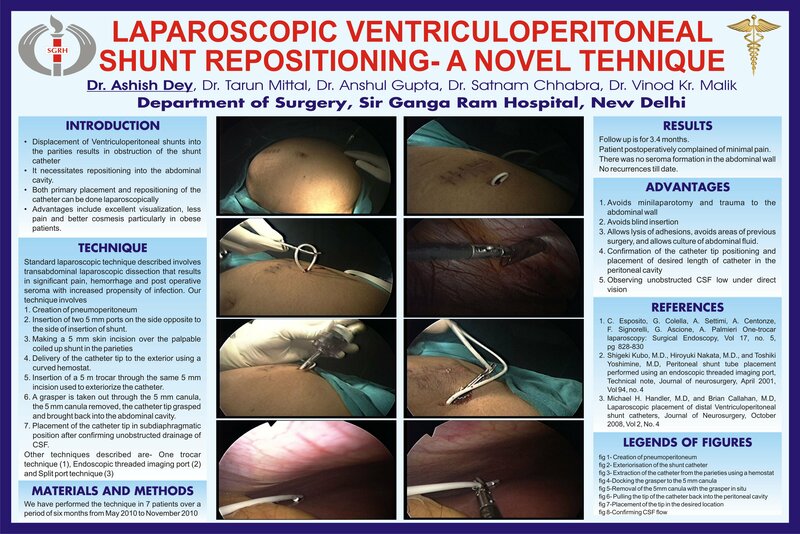 Most authors describe laparoscopic repositioning of displaced shunt catheters by transabdominal dissection using laparoscopic dissecting instruments to locate the catheter that is found coiled up in the parieties, mostly in the subcutaneous tissue. However extensive dissection in the parieties is often required to locate the catheter tip. Other techniques using one trocar technique, endoscopic threaded imaging port and split port technique has also been described. We here describe a simple technique of repositioning of the catheter in case of catheter displacement. Methods and procedures : The position of the displaced catheter tip can be confirmed using a lateral abdominal radiograph. A small 5mm incision is taken on the site of the expected position of the catheter after careful external palpation. In most instances it is possible to exactly identify the underlying displaced catheter. A small hemostat can be inserted through the 5mm incision and gently maneuvered to deliver the catheter to the outside. Extreme precaution is taken as regards maintenance of sterility while handling the catheter. After CO2 insufflation, under direct vision a 5mm trocar with canula is inserted through the same 5 mm incision carefully avoiding the catheter. A laparoscopic grasper in taken out through the canula and the canula is removed. The tip of the catheter is carefully held with the grasper and introduced into the abdominal cavity. After confirming free flow of CSF through the catheter tip it is then carefully placed in a subdiaphragmatic position after ensuring an adequate length of the catheter inside the peritoneal cavity. This allows unobstructed drainage of CSF with less possibility of tip migration. The entire available length of the catheter is inserted without tension. Conclusions based on the results: Laparoscopic placement has advantages including less pain, less bleeding , less post operative fluid collection and reduction of infection as compared with open placement.